Happy Friday!! !This weekend I’ll be spending time in my favorite state, California, wrapping up an amazing week in LA with family and friends, and heading north to the city that has my heart, San Francisco, to get a head start on birthday festivities with family and friends. This weekend the goal is to soak in the fun and the sun. To simply- REVEL. Rev·el- To engage in uproarious festivities; make merry. 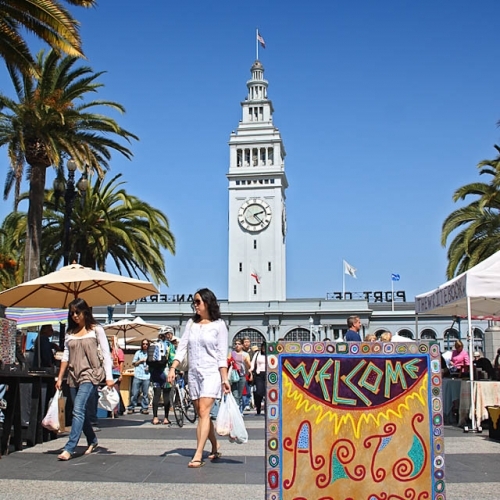 The Embarcadero has quickly become one of my favorite places to visit when in San Francisco. It’s a market place with indie art vendors out front and indie food vendors inside, so basically heaven for art lovers and foodies like myself. There is one shop I adore, Mariposa, that serves all types of gluten free goodies including a mean little veggie pizza with veggies like zucchini, squash, broccoli, and spinach, and tomato. It’s nice to get a treat from Mariposa and then sit out back by the water taking in the sun and beauty of the bay. But just because I am bragging about Mariposa doesn’t mean I don’t like the artisan cheese place or the chocolate spot or the seafood restaurant. It also doesn’t mean I don’t appreciate the one of a kind creativity that ushers you into the indoor market place. So much goodness all in one spot. Definitely a reason to revel. Believe it or not, I’ve gone to San Francisco enough to create a circle of good folk that I look forward to seeing and catching up with each time I visit. Not to mention, there’s one good person who is coming from the east coast to help me with the early birthday festivities, my brother Allen. It’s his first time out west and I look forward to showing him around and introducing him to my circle of good people and having good times. I haven’t yet posted my “Can’t LIVE Without Brunch” post, but it’s coming. There’s nothing like Sunday morning Brunch. 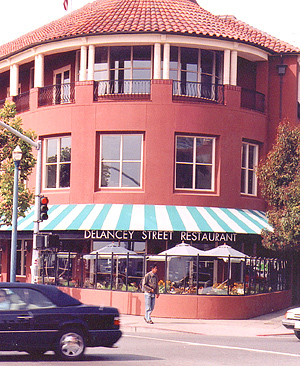 I look forward to getting brunch at Delancey Street Restaurant. Beyond the great eats, Delancey Street is staffed by individuals who have served time in prison. I really like the idea of eating at a restaurant committed to giving people who paid their debt to society a second chance. I wish more companies were committed to this kind of work. I can revel in eating good for good. You can’t have an uproarious festivity or make merry without a little dancing. Well I guess you could, but I wouldn’t recommend it. There will totally be some dancing this weekend for the pre birthday festivities. There might even be dancing until….the sun comes up. We shall see. What are you going to REVEL in this weekend?